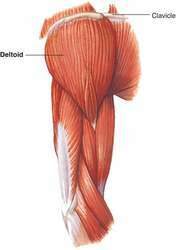 a large, thick triangular muscle that covers the shoulder joint. It is the prime mover of arm abduction. It is also a synergist of arm flexion, extension, and medial and lateral rotation. Also called deltoideus. Origin, lateral third of clavicle, lateral border of acromion process, lower border of spine of scapula; insertion, lateral side of shaft of humerus a little above its middle (deltoid tuberosity); action, abduction, flexion, extension, and rotation of arm; nerve supply, axillary from fifth and sixth cervical spinal cord segments through brachial plexus. 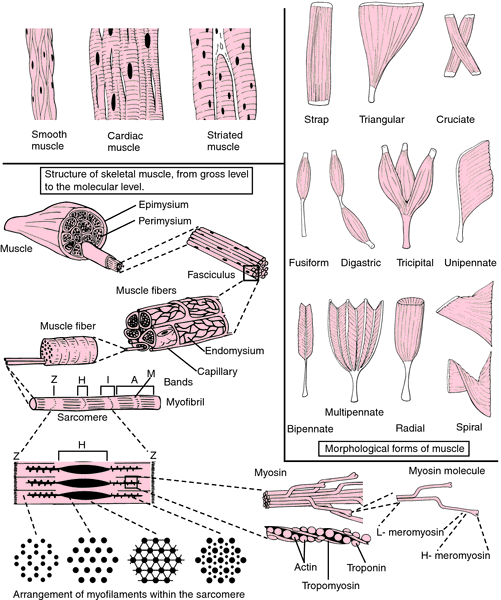 Synonym(s): musculus deltoideus [TA] , deltoid (2) . The large, triangular ‘shoulder-pad’ muscle which raises the arm sideways. the muscle which covers the shoulder joint. Arises from the shoulder girdle, in continuity from the outer third of the front of the clavicle, the acromion of the scapula above the shoulder and the spine of the scapula behind it. From here the fibres converge to be inserted into the 'deltoid tuberosity' on the outer side of the humerus. A powerful abductor of the arm. a lateral muscle of the shoulder, between the scapula and the humerus that helps flex the shoulder and abducts the arm. See also Table 13.